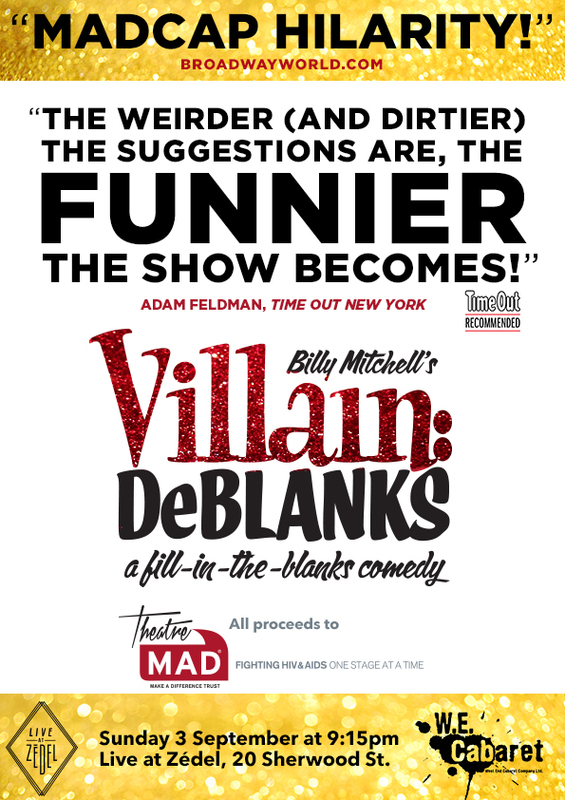 Audience favorite Villain: DeBlanks will make its London debut on Sunday, September 3 — and all proceeds benefit TheatreMAD. You’ll laugh your (BODY PART) off! A Time Out NY Critics’ Pick written by Billy Mitchell, Villain: DeBlanks is the uproarious improvisational comedy where the cast says words you put in their mouths. The audience provides nouns, adjectives, verbs, etc. (the wilder, the better), and the actors provide the laughs — uncensored and unrehearsed — as they enact the story of Philip DeBlanks’ untimely demise. It is “Clue” meets adult “Mad Libs,” and it’s never the same show twice! This benefit performance made possible through a grant from AE Ventures Foundation. Cast information coming soon. Visit villaindeblanks.com to learn more about the show.